What is ash? Ash is defined as the total mineral content of forage and exists in two forms, internal (or endogenous) and external (or exogenous). Internal ash is naturally occurring minerals found in plants, some of which have nutritional value to livestock (i.e. calcium, potassium, phosphorus) . On average, grass forages have 6% internal ash (on a dry matter (DM) basis), while legumes have 8% internal ash. External ash is commonly associated with soil contamination and provides no nutritional value to animals. Higher levels of ash content in forages (≥8% DM) are problematic since external ash provides no nutritional value to livestock and may lead to reduced economic efficiencies when purchasing hay. Previous research has determined that wide swaths, cutting heights ≥2 inches, and flat knives on hay mowers resulted in harvested forage with less ash content. Because soil disturbance is possible during hay raking, this harvest phase has a potential to affect ash content of forage; however, the effect of raking on ash content has not been evaluated before this study. Figure 1. 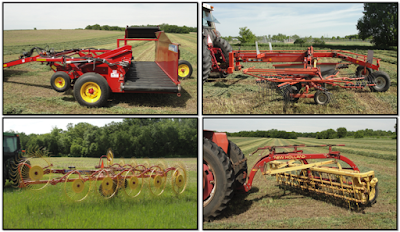 Clockwise from top left: merger, rotary rake, sidebar rake and wheel rake. Research: Research was conducted in Minnesota, Pennsylvania and Wisconsin to evaluate four types of hay rakes and their contribution to ash content in alfalfa hay. A merger, rotary-rake, sidebar, and wheel rake were evaluated at all locations during two cuttings in 2015 (Figure 1). Samples were collected during the four phases of hay harvest: standing forage, post-cut, post-raked, and post-baled and analyzed for ash content and forage nutritive values. Hay rakes were adjusted according to manufacturer recommendations and run at a standardized range of speed, operating width, PTO or PSI at each site. Sidebar rakes were set to operate at 1/4 inch above the field surface. Results: Hay rake-type affected ash content post-raking at all site-cuttings except for first cutting in Wisconsin (Table 1). The wheel rake consistently resulted in the greatest ash content post-raking, while the hay merger and sidebar rake resulted in the least amount of ash. The rotary rake resulted in intermediate amounts of ash. These results confirm the general observation that different types of hay rakes result in different amounts of ash post-raking. Machine operation and settings can greatly impact ash content, including non-optimal ground speed, PTO speed, or height adjustment on rakes and merger pickups. Ensuring rakes are adjusted and operated at manufacturer recommendations will help reduce ash content. Throughout the harvest process, crude protein ranged from 20 to 24%, neutral detergent fiber (NDF) from 37 to 48% and NDF digestibility from 39 to 53% (on a DM basis). However, differences in forage nutritive value due to hay rake type were rarely observed and forage nutritive values remained consistent throughout the harvest process. First cutting alfalfa differed in relative forage quality (RFQ) post-raking where the hay merger and sidebar rake resulted in greater RFQ values (121-165) compared with the wheel rake (114-160; data not shown). Table 1. Ash content of standing (Stand), post-cut (Cut), post-raked (Rake) and post-baled or chopped (Bale) alfalfa hay after first and a subsequent cutting in Minnesota, Pennsylvania and Wisconsin in 2015. Hay was raked with a hay merger (Merger), rotary rake (Rotary), sidebar rake (Sidebar) or wheel rake (Wheel). a-bWithin each column, location and cutting, means without a common superscript differ. No superscript indicates no differences were observed. †Values represent the mean of samples (n=16) collected across the field. The impact of feeding livestock hay with higher ash content is not well understood, but it is thought that excessive ash content could be a barrier to maximizing milk and meat production, and may lead to sand colic and reduced absorption of nutrients in horses. For example, in Minnesota first cutting hay, the wheel rake resulted in 14.6% ash while the hay merger resulted in 11.4% ash post-baling. If a livestock producer fed 25 lbs. of alfalfa hay containing 14.6% ash (or 6.6% external ash), they would be feeding 1.6 lbs. of soil contamination to their livestock compared with 0.8 lbs. of soil contamination if the hay contained 11.4% ash (or 3.4% external ash) on a daily basis. Excessive ash content can also be problematic when buying hay. Using the same values as above, 1 ton of hay containing 14.6% ash would contain 132 lbs. of soil contamination compared with 68 lbs. of soil contamination when the ash content was reduced to 11.4%. At an average cost of $150 per ton, a hay buyer would be spending $9.90 per ton on soil contamination of hay raked with a wheel rake compared with $5.10 per ton on soil contamination with hay combined with a hay merger. Acknowledgements. Funding for this research was possible through the USDA-NIFA Alfalfa Seed and Forage Systems Research Program and was a collaboration between the University of Minnesota, Pennsylvania State University and the University of Wisconsin. We acknowledge the cooperation of Leaning Pine Farm and thank New Holland Agriculture for the use of the hay merger in Minnesota. For More Information: A full manuscript is available in the Agronomy Journal (“Hay Rake-Type Effect on Ash and Forage Nutritive Values of Alfalfa Hay”) and a YouTube video is available at https://youtu.be/tfV0uAXF0zU.